Don’t believe everything you read on the Internet. If you think Chuck Yeager, flying the Bell XS-1 on October 14, 1947, was the first pilot to fly faster than the speed of sound, you are absolutely right. If you are among those who believe that George Welch, flying the North American XP-86, beat Yeager to the punch—you are, I can say with conviction, wrong. I say it not only with conviction but with a little chagrin. In our December 1998/January 1999 issue, we published an excerpt from the book Aces Wild: The Race for Mach 1, which tells the story of Welch’s flights in the XP-86, the prototype of the formidable F-86 Sabre. That excerpt helped spread the story that during the XP-86’s maiden flight, on October 1, 1947, Welch became the first past Mach 1, even though we added an editor’s note reading: “Yeager was able to claim an official record because all airspeed, Mach number, pressure, and temperature data from test flights were tracked, recorded, and documented.… [C]laims that the North American XP-86 achieved Mach 1 are merely anecdotal.” In the 15 years since that article appeared, those “anecdotal” claims have spread to books, magazine articles, and dozens of websites. Aces Wild is a colorful portrait of post-World War II flight research, important for what it reveals about the era and place in which flight first went supersonic. The author, the late Al Blackburn, wasn’t there when pilots were attempting to break the sound barrier. Though a test pilot with North American Aviation, he didn’t join the company until 1954, but he portrayed the culture and personalities so vividly, readers feel as though they were there in the Mojave Desert in 1947. Before making that decision, read the cover story of the British magazine Aviation Classics, issue 9, published on March 24, 2011. The author, Duncan Curtis, notes that throughout the XP-86’s first flight, Welch struggled with the landing gear. Curtis quotes from the North American report to the Air Force, which describes Welch’s attempts to get the main landing gear up and, later, the nose gear down. (Welch was ultimately able to land safely.) Since the gear problem appeared immediately after takeoff, Curtis concludes that Welch had no opportunity to dive for Mach 1. For the next few tests, North American decided it would be safer to fly the XP-86 with the gear locked down, creating too much drag for Mach-busting. The next time the aircraft flew with the gear retracted was after Yeager had taken the X-1 supersonic (the Air Force dropped the “S” from the aircraft designation in 1948). North American Aviation aerodynamicist Ed Horkey, who witnessed the first XP-86 flight, disagreed about the J35’s limitations. In a speech he made in 1994 to the F-86 Sabre Pilots Association, he said that Welch hit Mach 1.02 on October 19, 1947, and that the speed was determined from tracking technology used by the National Advisory Committee for Aeronautics. The official Air Force position is that the XP-86 first passed Mach 1 in a dive on April 26, 1948. The achievement was not acknowledged at the time; the Air Force had classified the flight test data on military aircraft, just as it had classified the X-1 program. Today, no one can find records documenting the flight, so details such as which engine the XP-86 used are lost. Was it the original J35, or, as Robert Kempel believes, an improved engine? Duncan Curtis is convinced the J35 could power the XP-86 to climb the mountain to Mach 1; as proof, he offers the testimony of Roland Beamont, a Royal Air Force test pilot who is as famous in the U.K. as Chuck Yeager is in the U.S. In his autobiography, Testing Years, Beamont quotes from the report he submitted after the single flight he made in an XP-86, on May 21, 1948: “After zoom-climbing back to about 36,500 ft a steeper max power dive was made from 36,000 ft and, according to the M[ach]-meter, unity [Mach 1] or a little over was reached at 29,000 ft, partially trimmed with a slight lateral roll in evidence and with some minor buffeting at the tail.” Though Beamont complained about its “slow acceleration and deceleration and oversensitivity to throttle movement at all altitudes,” the engine that powered his flight was the J35. In the National Archives, I found more evidence suggesting that the J35-powered XP-86 could have made it to Mach 1. 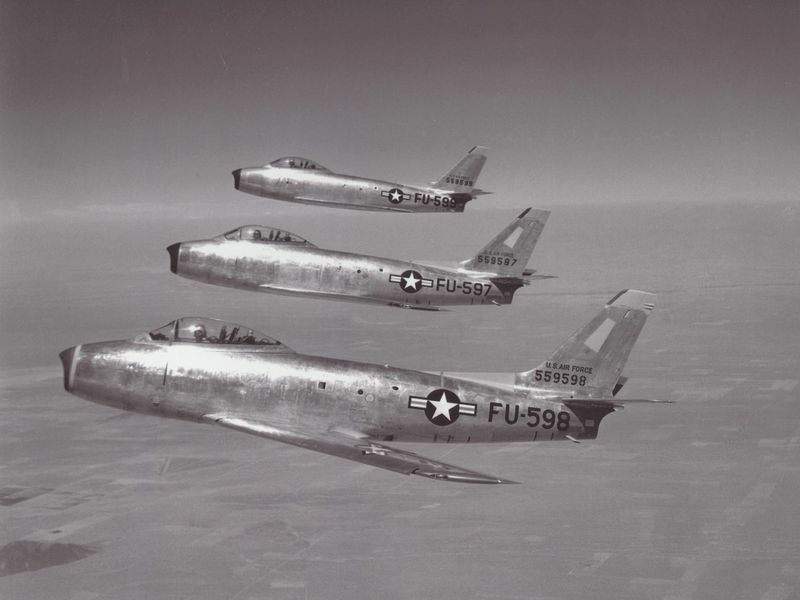 In the final collection of flight reports North American submitted to the Air Force, company engineers hint that George Welch flew the XP-86 past Mach 1 on November 19, 1947, and again two days later. “The report [does] not present information [for flights] at Mach numbers above .919 in order that this report may be classified as confidential and be available to the majority of parties interested. (Data classified as secret [a higher level of security] will be presented in Appendix form under separate cover…. )” In Progress Report 10, the company presents data “in accordance with the maximum Mach 1.0 limit.” Under the Air Force classification rule, North American couldn’t make the documentation of a Mach 1 flight public. So where is the “data classified as secret”? In Aces Wild, Blackburn writes that the North American Aviation records were loaded on rail cars for transfer to the U.S. Air Force. At the Air Force Test Center at Edwards, Wade Scogram of the history office says those documents were shipped to the Air Force Historical Research Agency at Maxwell Air Force Base, Alabama. Do the agency’s 70 million pages of records include that top-secret appendix? When I asked about it, archivist Archangelo Difante checked the accessioned collection and found no flight reports. If an XP-86 broke the sound barrier before the April date in the official Air Force histories, the record of that flight is gone. If North American’s classified data ever shows up—and we’ll keep looking—it could prove that the XP-86 reached Mach 1 on November 19, 1947. And that would finally convince doubters that Yeager was first…but not by much. Linda Shiner is the editor of Air & Space. What Couldn’t the F-4 Phantom Do?